La Belle Lucie is a pile based solitaire card game similar to Cruel Solitaire or Shamrocks Solitaire. The player is dealt 17 piles of 3 cards and one pile with 1 card in it. The player builds down the piles by suit while trying to build up the four suit piles on the left. In any given game, the player is allowed to shuffle the cards still in play up to 3 times. If you're not familiar with La Belle Lucie, the game begins with 18 piles. 17 of those piles have 3 cards in them, and one pile has one. There are 4 suit piles on the right, that you are trying to build up from Ace to King by suit. You can build down all the other piles by suit. Having a lot of piles helps, but if you remove all the cards from a piles it is gone, and you can't start it over again (though it might come back when you shuffle). This game would be almost impossible, if you where not allowed to shuffle all the cards that are not in the suit piles up to 3 times in any game. Wait to use the shuffles until you need them. Golf Solitaire is a classic solitaire card game where the player tries to remove all the cards in 7 columns. You can remove a card by adding it to the discard pile if the cards value is one more than or one less than the card on top of the pile. Card game for 3 or 4 persons with variant of The Tarot of Marseilles. The 18th century ancestor of Hearts was called Reverse. Remove all the cards in the pyramid by pairing them with other cards in such a way the sum of the pairs is 13. Looking for a new twist on solitaire? Solitaire Twist Collection combines the classic strategy of solitaire with wild layouts, fun power-ups and stunning visuals! Match pairs to clear the board and reveal hidden cards one-by-one. 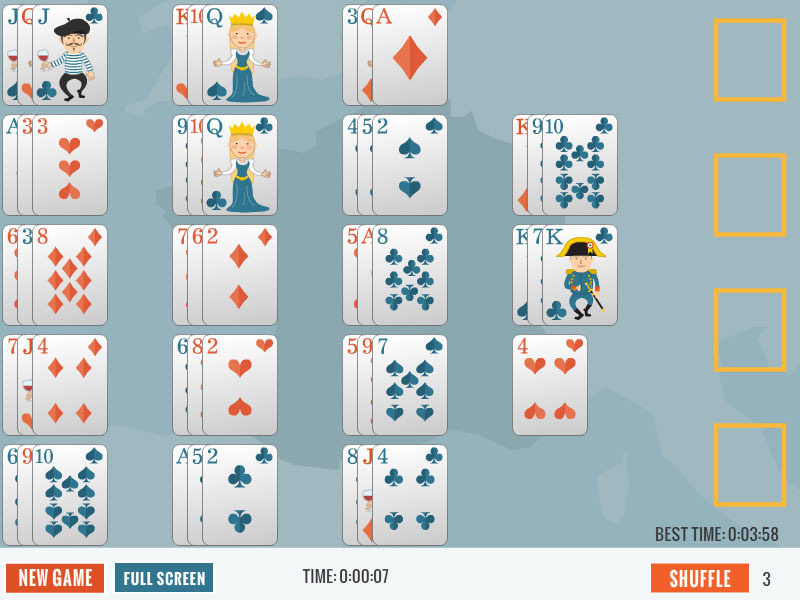 Solitaire is an exciting way to pass the time - anywhere, any time. Whether you are at home on lazy day, at the office taking a break, or outside with your laptop soaking in the sun, spice up your day with a game of solitaire. Escape a mundane task. The New Year's Eve fireworks are exploding with excitement to play New Years Three Card Klondike Solitaire! Once you've mastered One Card Klondike, give yourself a little bit of a challenge by playing Three Card Klondike Solitaire! New freeware cards solitaire game in mystic style from ArcadeGamePlace.com. The game in patience starts in the old house in the magic room at nightfall. Remove all cards from the table. Download and play absolutely free for Windows and Mac OS. Do not lose the opportunity to play this new free colorful solitaire game in Hawaiian style from PlayOnlineSolitaireGames.com. Time passes slowly and serenely at the picturesque islands. This site does not contain serial number, crack, keygen La Belle Lucie serial number : serial number is the simplest type of crack. A serial number(cdkey,product key,etc) is register the program as you may already know. a crack or keygen may contain harmful software. If you cannot find the exact version you want, just give it a try. for more information read .nfo/.txt/.diz file include in zipped file.